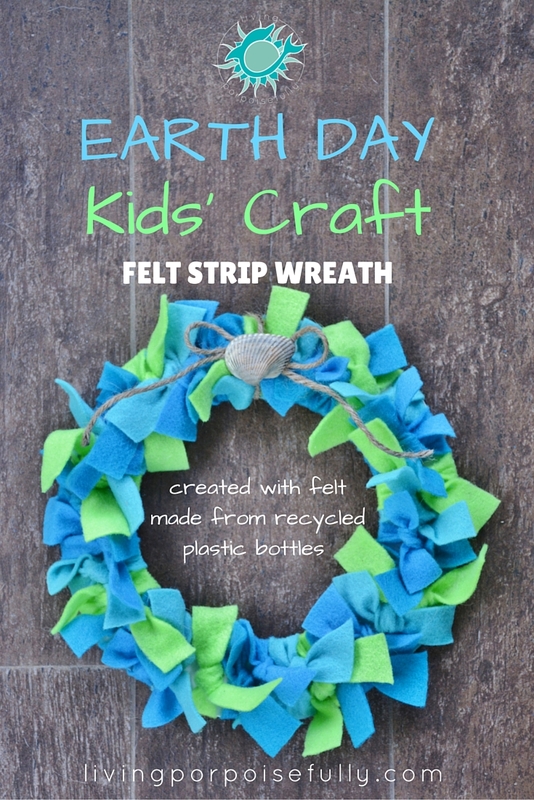 To celebrate Earth Day, this fun kids’ craft is a fantastic way to mark the occasion and bring awareness and action to what Earth Day is all about. To reflect this important day on April 22nd, our craft is made with felt that was made from recycled plastic bottles! If you have kids in your life, this holiday makes for a very special chance to teach kids about the importance of taking care of our world, both our land and oceans. After all, both give us food, water, air to breathe, and our home sweet home. Make a list of all of the things you use that you can recycle. Post the list in a central area (like the kitchen) as a reminder each day to recycle them whenever you can. Use a reusable water bottle rather than single-use ones. It would be a good idea for each family member to have one. Be mindful of the running faucet. Turn it off when you don’t need it. Use a reusable cloth towel instead of paper towel. Don’t litter. It can end up in animals’ homes and bellies, and all the way in the ocean too. Turn off lights and appliances when you’re not using them. As a family, look at the products you use and go on a quest to see if there are any better alternatives for the future. We all can make a difference! What we do matters, and has impacts to even the furthest oceans. Keep in mind that it’s all about becoming more mindful and aware of our impact, and taking steps to better care for our environment. And now for the craft how-to instructions to celebrate a commitment to care for Mother Earth all year long. Enjoy and have a happy Earth Day! Why 3 blue and 1 green? Our world is made of almost 3/4ths water! *On our search for eco-friendly options, we were so excited to find felt made with eco-fi, which is a fiber made from 100% recycled plastic bottles. We found the felt at Michaels on the aisle with other kid-craft items (like pipe cleaners and pom-poms) in all sorts of colors. And other craft stores sell it too, so just check the tag on the back to see that it says “eco-fi” (see picture below). Make a hole in the inside part of the paper plate (use the end of a scissor blade, pencil point, etc. ), and then use the scissors to cut the center out, leaving a rim. Cut each piece of felt horizontally into about 12 strips, about 1″ wide each (it doesn’t need to be perfect). Tie a strip of felt around the rim of the paper plate, and knot it. Put another strip around the rim right next to the first one, and knot it. We stuck with a pattern of aqua, then blue, then turquoise, then green, but of course make it whatever you like! Keep going until you get all the way around. This is a great way for kids to get practice in tying knots! We wanted to put an earthy touch to our wreath, so we chose a seashell from the many we’ve picked up on the beach, applied glue, and pressed it over the bow. Keep in mind that the glue will stick best to the twine and not the felt. And there you have it, a recycled craft to celebrate Earth Day that gives a great chance to teach kids about the importance of caring for our world, not just today but everyday. Enjoy crafting and connecting with your little ones, and know that your enthusiasm is so contagious to kids. Have a very happy Earth Day, our fellow Earthlings!